Danis Tanović (born 20 February 1969) is a Bosnian film director, producer and screenwriter. Tanović is best known for having directed and written the script for the 2001 Bosnian movie No Man's Land which won him the Academy Award for Best Foreign Language Film. 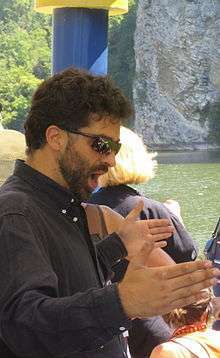 He is widely considered one of the best contemporary Bosnian filmmakers of his generation and has garnered critical acclaim for many of his movies. In 2008, Tanović established Naša Stranka, a grassroots political party based in Sarajevo. He was a member of the jury at the 2003 Cannes Film Festival. His most recent films include Triage (2009), starring Colin Farrell, Paz Vega and Christopher Lee and Cirkus Columbia (2010), starring Miki Manojlović and Mira Furlan. Tanović was born in Zenica on 20 February 1969. Tanović was raised in Sarajevo, where he also received his primary and secondary education. He also attended the University of Sarajevo Music Conservatory, where he played the piano. As a young adult, Tanović decided to study at the Academy of Performing Arts in Sarajevo. However, due to the Siege of Sarajevo, Tanović was forced to stop his studies in 1992. Immediately after war broke out, Tanović formed a film crew that followed the Army of Bosnia and Herzegovina, going on dangerous missions. The material that Tanović and the film crew produced has since been used in numerous films and news reports about the Siege of Sarajevo and the Bosnian war. In late 1994, Tanović left the film crew he had worked with for over two years. A year later, Tanović decided to resume his studies, this time in Brussels, the capital of Belgium. In 1997, Tanović completed his studies in Brussels, graduating at the top of his class. During his studies he made several critically acclaimed documentary films. Shortly after, Tanović began his first movie project, entitled No Man's Land. He wrote and directed the movie, which was completed in 2001 and premiered at the Cannes Film Festival that same year. No Man's Land went on to win the Award for Best Screenplay (Prix du scénario) at Cannes, followed by numerous awards, including the Oscar for Best Foreign Language Film in 2001, while in competition with French Amélie. Tanović was presented the Oscar by John Travolta and Sharon Stone. Briefly after, Tanović thanked everyone who worked with him on the film and supported its creation. He ended his acceptance speech by saying, "This is for my country, Bosnia", expressing his devotion and patriotism to his home country. In total, No Man's Land won 42 awards, including the Oscar for Best Foreign Language Film, the European Film Academy Award for Best Screenplay, the César for the Best First Feature Film, the André Cavens Award for Best Film in 2001, and the Golden Globe Award for Best Foreign Language Film in 2002. Upon international theatrical release, the film was embraced by critics and those who went to see it, for its darkly humorous and gripping tale on the absurdity of war. It is probably the most awarded first feature film in a history of film making. Tanović's second feature project was L'Enfer, completed in 2005, from the screenplay by the late Krzysztof Kieslowski and Krzysztof Piesiewicz. The film marked the second installment in the Polish duo's projected trilogy Heaven (filmed by Tom Tykwer in 2002), Hell and Purgatory. Inspired by Euripides' Medea, L'Enfer explores the lives of three sisters, "each locked in her own unhappiness, nursing a secret flower of misery, the seed for which was planted by their late father with a terrible incident in their girlhood" (from a review by Peter Bradshaw). Tanović holds joint Bosnian and Belgian citizenship and lives in Sarajevo with his wife and five children. He lived in Paris until 2007. Tanović announced in March 2008 that he would be founding a political party, Naša Stranka, which would start contesting elections with the local elections in October 2008. He stated his motivations as wanting to bring political change to the country; his announcement was received positively. His 2010 film Cirkus Columbia was selected as the Bosnian entry for the Best Foreign Language Film at the 83rd Academy Awards, but it didn't make the final shortlist. In June 2011, he was bestowed with an "honoris causa" doctorate by the University of Sarajevo. His 2013 film An Episode in the Life of an Iron Picker premiered in competition at the 63rd Berlin International Film Festival where it won two prizes: Silver Bear for Best Actor and the Jury Grand Prix. The film was shortlisted (9 best foreign films ) for the Oscars but didn't make to final five nominees. His latest film "Death in Sarajevo" won Jury Grand Prix at the 66th Berlin International Film Festival. It has also won FIPRESCI Award for the best film in competition. Currently, he works as a professor of film directing at Academy of Performing Arts in Sarajevo. ↑ "Bosnia selects Cirkus Columbia; Bulgaria submits Eastern Plays for Oscars". Screendaily. Retrieved 29 September 2010. ↑ "9 Foreign Language Films Continue to Oscar Race". oscars.org. Retrieved 19 January 2011. ↑ "Berlinale Competition 2013: Another Nine Films Confirmed". berlinale. Retrieved 24 January 2013. ↑ "Prizes of the International Jury". berlinale. Retrieved 16 February 2013. ↑ "No Mans Land". rottentomatoes.com. 2001. Retrieved February 27, 2015. ↑ "No Mans Land". metacritic.com. 2001. Retrieved February 27, 2015. ↑ "11'09\"01 September 11". rottentomatoes.com. 2002. Retrieved February 27, 2015. ↑ "L'Enfer". rottentomatoes.com. 2005. Retrieved February 27, 2015. ↑ "Circus Columbia". rottentomatoes.com. 2010. Retrieved February 27, 2015. ↑ "Circus Columbia". metacritic.com. 2010. Retrieved February 27, 2015. ↑ "An Episode in the Life of an Iron Picker". rottentomatoes.com. 2013. Retrieved February 27, 2015.